Author(s): Eva E. Rufino-Palomares, Amalia Perez-Jimenez, Fernando J. Reyes-Zurita, Leticia Garcia- Salguero, Khalida Mokhtari, Antonio Herrera-Merchan, Pedro P. Medina, Juan Peragon, Jose A. Lupianez. Department of Biochemistry and Molecular Biology I, Faculty of Sciences, University of Granada, Avenida Fuentenueva s/n. 18071 Granada, Spain. Biological Sciences Building, 4th Floor, Offices nº 13 and 14. Pentacyclic triterpenes are natural substances, synthesized and present in variable amounts in a large number of terrestrial and aquatic plants, which act not only as antioxidants and antimicrobials but also as poisons, antibiotics, protease inhibitors, and so on. From the organic chemistry point of view, they are compounds derived from isoprene. These compounds consist of 30 carbons with different substituents, which facilitate their chemical identification and confer different physico-chemical and molecular properties. During the last ten years, most of them have been reported to have a variety of interesting and significant biological properties, such as analgesic, anti-allodynic, anti-diabetic, anti-oxidant, anti-parasitic, antimicrobial, anti-viral, anti-atherogenic, anti-inflammatory, anti-proliferative, anti-tumour, growth-stimulating activities as well as cardioand neuro-protective activity. However, special attention has been focused on the study of their anti-tumour capacity, fundamentally, on the various molecular mechanisms involved in the induction of programmed cell death and the inhibition of metastatic activity, in different types of cancers. Researchers have also focused on the role that different RNA molecules play in the anti-tumour activity of the major triterpenes studied. 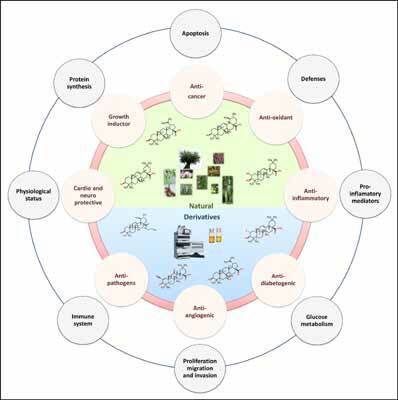 In this review, we look at the recent advances reported on the anti-tumorigenic roles of the main representatives of this group of compounds, such as betulinic (BA), ursolic (UA), oleanolic (OA) and maslinic (MA) acids and some of their derivatives, with a special emphasis on cell apoptosis and angiogenesis. Keywords: Anti-cancer activity, apoptosis pathways, angiogenesis, cancer cell lines, cell growth, DNA and membrane damage, RNA and cell death, pentacyclic triterpenes. Affiliation:Department of Biochemistry and Molecular Biology I, Faculty of Sciences, University of Granada, Avenida Fuentenueva s/n. 18071 Granada, Spain. Biological Sciences Building, 4th Floor, Offices nº 13 and 14. Keywords:Anti-cancer activity, apoptosis pathways, angiogenesis, cancer cell lines, cell growth, DNA and membrane damage, RNA and cell death, pentacyclic triterpenes. Abstract:Pentacyclic triterpenes are natural substances, synthesized and present in variable amounts in a large number of terrestrial and aquatic plants, which act not only as antioxidants and antimicrobials but also as poisons, antibiotics, protease inhibitors, and so on. From the organic chemistry point of view, they are compounds derived from isoprene. These compounds consist of 30 carbons with different substituents, which facilitate their chemical identification and confer different physico-chemical and molecular properties. During the last ten years, most of them have been reported to have a variety of interesting and significant biological properties, such as analgesic, anti-allodynic, anti-diabetic, anti-oxidant, anti-parasitic, antimicrobial, anti-viral, anti-atherogenic, anti-inflammatory, anti-proliferative, anti-tumour, growth-stimulating activities as well as cardioand neuro-protective activity. However, special attention has been focused on the study of their anti-tumour capacity, fundamentally, on the various molecular mechanisms involved in the induction of programmed cell death and the inhibition of metastatic activity, in different types of cancers. Researchers have also focused on the role that different RNA molecules play in the anti-tumour activity of the major triterpenes studied.